A Minotaur rocket roared into orbit from the Virginia coast Wednesday night, successfully deploying a small spacecraft to make the benefits of satellite technology more accessible to deployed U.S. military forces in Afghanistan and other war zones in the Middle East. Developed on a rapid timeline for the Pentagon's Operationally Responsive Space office, the satellite will snap images of the battlefield and relay them directly to troops, bypassing intelligence analysts and ground controllers in the United States. 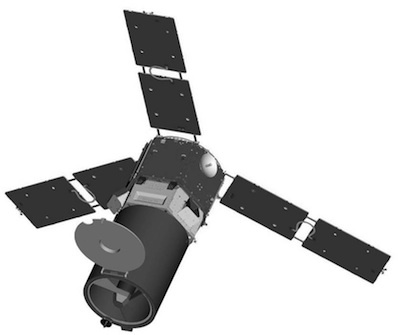 The ORS 1 satellite's importance is highlighted by the planned reduction in troop levels in Afghanistan, according to a U.S. Air Force space official. "It's even more critical as we look at operations in CENTCOM and the Department of Defense starts to draw down troops," said Peter Wegner, director of the ORS office. "Capabilities like ORS 1 are truly force-enablers and force-multipliers for those young men and women, allowing them to see what's going on around them." With less manpower on the ground, forces will need a technological edge over the enemy. The ORS 1 spacecraft will operate at the whim of troop commanders on the battlefield, while legacy reconnaissance satellites typically capture strategic imagery that ends up in the hands of analysts in Washington, D.C.
"As terrorists move around the world to other locations, space-based [intelligence, surveillance and reconnaissance] capabilities are going to very critical to the future of our country," Wegner said. The 957-pound spacecraft blasted off at 11:09 p.m. EDT Wednesday (0309 GMT Thursday) atop a Minotaur 1 rocket from the Mid-Atlantic Regional Spaceport at Wallops Island, Va. The seven-story booster, powered by decommissioned Minuteman missile stages, streaked into a clear sky and surpassed the speed of sound in the first half-minute of flight. 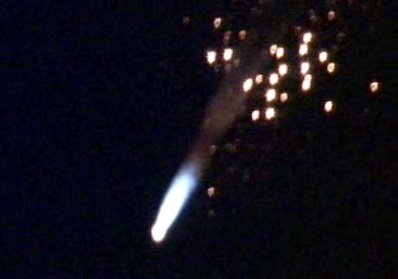 The launch was visible up and down the East Coast from North Carolina to New York. Turning southeast from the Virgnia coast, the Minotaur shed its solid-fueled first and second stages within two-and-a-half minutes. The rocket's third and fourth stages, derived from the air-launched Orbital Sciences Corp. Pegasus rocket, accelerated the ORS 1 satellite to orbital velocity at an altitude of approximately 250 miles. The launch was aiming for an orbital inclination of about 40 degrees to the equator. All indications are the rocket reached a "very nominal" orbit, according to a senior manager overseeing the launch. The launcher released the ORS 1 satellite about 12 minutes after liftoff, concluding the 10th flight of the Minotaur 1 rocket since 2000. All the flights have been successful. Officials plan a 30-day checkout period for the ORS 1 satellite before handing control authority over to the 1st Space Operations Squadron at Schriever Air Force Base, Colo., according to Col. Carol Welsch, the Air Force's ORS 1 mission director. Wednesday's launch achieved a breakthrough in the Pentagon's program to field tactical satellites on smaller budgets and tighter schedules. The ORS office was established in 2007 to answer urgent military needs with more focused satellite missions. After launching two demonstration satellites, the ORS office received orders to build its first operational satellite in 2008. The call came from CENTCOM as an "urgent need" to supply high-resolution tactical imagery to troops in realtime. From the perspective of a ground operator, the ORS 1 satellite will look much like an unmanned aerial vehicle equipped with surveillance gear. "The data will come back to the operators at U.S. Central Command in the very same format that they get this today today from those airborne assets," Wegner said before launch. "That's pretty unique. The power and benefit of space systems is that you can fly over the entire world very quickly. You can be around the world in 90 minutes and look at a completely different spot. It gives you that flexibility now in an asset that looks just like an airborne asset that they're used to flying and operating today." The spacecraft bus was manufactured by ATK Space Systems in Maryland in less than a year-and-a-half. It took 30 months to deliver the integrated satellite and imaging sensor for launch, according to Frank Giglio, ORS 1 program manager at Goodrich. "It's very tactical and operates on a very short timeline," Wegner said. Developed and declared ready for launch in 30 months, the $226 million ORS 1 mission is breaking the paradigm of military space programs, which are prone to high costs, long development cycles and strict requirements, officials said. "One of our charters is to build and deploy space capabilities quickly. I can tell you this is incredibly fast for a military space system," Wegner said. "This was a brand new capability that we started two-and-a-half years ago. There was nothing. We started with a blank sheet of paper and a need from Central Command."